During the PN the deteriorations that begun during the PPNC continued. PN sites frequently contain less substantial structures than during the PPNB. Often these are no more than circular huts, and while more complex architecture does exist at 'Ain Ghazal (Rollefson et al. 1992:450-452), Jebel Abu Thawwab (Kafaf 1988), Wadi Ziqlab (Banning 1995; Banning et al. 1989, 1994), Shar'arHagolan (and possibly other sites) (Garfinkel 1993:127-129), it is not as elaborate or well constructed as previously. Regardless of variations in architecture, however, major sites such as 'Ain Ghazal and Wadi Shu'eib shrank in size during the PN (cf. Rollefson 1996; Rollefson et al. 1992:466-468). This clearly has social implications relating to family and clan arrangements. The early change (PPNA to PPNB) from circular to rectangular structures and possible social implications has been discussed by Flannery (1972, 1993), but this issue has not been addressed for the PN despite the widespread "return" to circular structures. Some of the major shifts that occurred during the PN are best exemplified by the dramatic economic transformations occurring at 'Ain Ghazal and Wadi Shu'eib. At these sites (particularly well represented at 'Ain Ghazal), principal subsistence strategies were now focused on a few select species, specifically sheep/goat. Although farming still occurred, a new emphasis on pastoralism developed. As detailed elsewhere (Kohler-Rollefson 1988; Rollefson and Kohler-Rollefson 1989), what had started out as mutually compatible economic systems of agriculture and animal husbandry turned into a mutually exclusive system. No longer could the already marginal environment, stretched to its limits by large aggregated groups of humans, allow for both strategies to be viable in the same locality. This situation was exacerbated by climatic conditions leading to a steady increase of arid conditions (cf. Davis et al. 1990). Thus the previously underutilized desert areas were now more intensively occupied by Neolithic pastoralists, while the better watered, but still marginal, core area maintained an agricultural focus. The cultural response to this was the evolution of two economic strategies during the PN, one based on farming and the other on pastoralism. Sites such as 'Ain Ghazal continued to function, but we can assume a deterioration in the organizational structure previously extant. If a substantial proportion of the population now practiced pastoralism, then it seems logical that social structure must have been reoriented toward smaller group sizes, at least for those engaged in this economic pursuit, and no longer required the elaborate social controls of the PPNB. Unfortunately, no burials have been uncovered from PN 'Ain Ghazal. Indeed, only three PN burials are documented for the entire Levant (Garfinkel 1993:127). Additionally, information on gender roles, so tantalizingly hinted at by PPNB ritual objects, is rare in the PN. Portable art, however, continues in the PN, and many figurines, including the intriguing "coffee-bean" eye forms, appear to be female. 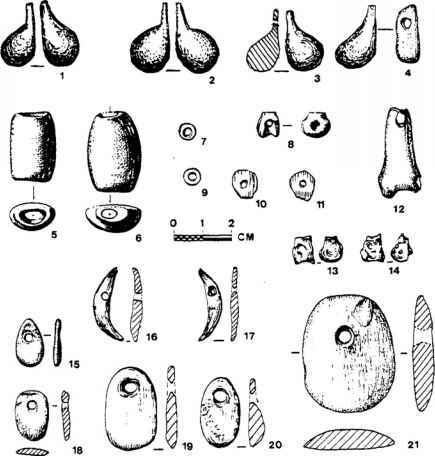 Others, however, are clearly male; even though no complete examples have been found, there are headless examples and torsos containing male genitalia (Garfinkel 1993:124). The presence of clear male figurines, generally absent in the PPN, may suggest some rather dramatic social changes that could be linked to traditionally male activities such as animal husbandry. One could, albeit tentatively, posit a reduction in the role of females during the PN, when pastoralism assumed more importance (see Chapters 11 and 12, this volume, for further discussion). Ultimately, as aridity increased and agriculture became even more difficult, the pastoralists may have had the adaptive edge. This resulted in the eventual abandonment of the large Neolithic towns. Subsequent cultural evolution during the Chalcolithic and later periods witnessed a new type of adaptation and settlement type. Social organization must have particularly suffered with such a radical change. From a period of but several hundred years, the fabric of life had gone from elaborate and large population aggregations focused on villages to one consisting of a splintering of populations, many of whom were nomadic, at least on an annual basis. Dramatic social reorientations would have been necessary to accommodate these changes in settlement and subsistence. The degree of centralized authority necessary for controlling a large settlement such as LPPNB 'Ain Ghazal would no longer have been necessary. A return to more clan- or tribal-oriented authority better adapted to pastoral life would now have been a more efficient control mechanism.